Artist’s rendering of LightningStrike vertical take-off and landing experimental plane (VTOL X-Plane). Image courtesy of Aurora Flight Sciences. The maiden flight of the LightningStrike VTOL is scheduled for 2018. Image courtesy of Aurora Flight Sciences. The 20% scale demonstrator of the LightningStrike aircraft. Image courtesy of Aurora Flight Sciences. The maiden flight of LightningStrike subscale demonstrator was successfully conducted in April 2016. Image courtesy of Aurora Flight Sciences. 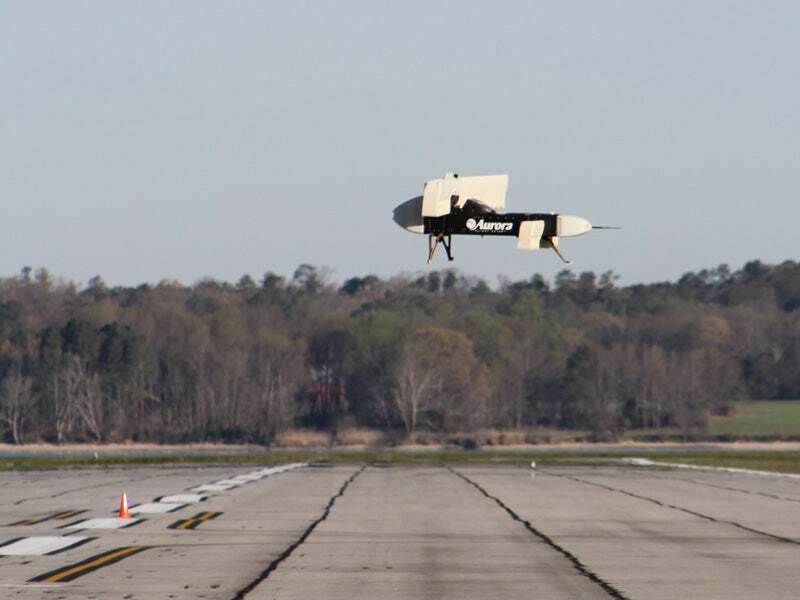 LightningStrike is an unmanned vertical take-off and landing experimental plane (VTOL X-Plane) developed by Aurora Flight Sciences in partnership with Rolls-Royce and Honeywell for the VTOL X-Plane programme of the Defense Advanced Research Projects Agency (DARPA). Aurora Flight Sciences was selected as prime contractor by DARPA for Phase 2 of the VTOL X-Plane programme in March 2016. The subscale demonstrator of LightningStrike successfully made its first flight at a US military base in April 2016. The flight satisfied the risk reduction objectives of the programme, while validating the aerodynamic design and flight control system. The demonstrator’s wings and canards were made of carbon composite material and 3D-printed plastics. The VTOL X-Plane programme is aimed at creating a new hybrid design through cross-pollination between fixed and rotary wing designs, to exceed the performance capabilities of existing VTOL aircraft. The programme was launched by DARPA in February 2013. Sikorsky Aircraft and Aurora Flight Sciences were awarded contracts for preliminary design studies in December 2013, while Boeing and Karem Aircraft were awarded contracts for Phase 1 of the programme in March 2014. Aurora Flight Sciences emerged as a winner of the Phase 2 and was awarded an $89.4m contract in March 2016, eliminating the other three contenders. The second phase of the programme will involve the development of two aircraft to conclude flight testing in Phase 3 by 2018. Developed for unmanned aerial vehicle demonstrator, the technologies can be applied to manned aircraft too. The unmanned VTOL aircraft design incorporates two large wings at aft and two smaller canards at front near the nose of the aircraft. Each wing and canard houses hybrid-electric propulsion ducted fans powered by a turbo-shaft engine mounted in the fuselage. "The VTOL X-Plane programme is aimed at creating a new hybrid design through cross-pollination between fixed and rotary wing designs to exceed the performance capabilities of existing VTOL aircraft." The aerodynamic wing design with integrated propulsion will ensure the wings to offer superior performance throughout the flight envelope, from take-off to landing. The aircraft will also be equipped with flight control systems to adjust the thrust of each fan according to the flight conditions. The aircraft will have a gross weight of up to 5,443kg (12,000lb) and be capable of carrying a useful load of 2,177kg (4,800lb). It will offer a minimum cruise lift-to-drag ratio of ten. The LightningStrike VTOL is installed with a Rolls-Royce AE1107C turboshaft engine, which is also in use with the V-22 Osprey tilt-rotor aircraft. The engine drives three Honeywell gen sets powering 24 distributed ducted fans, three each in the forward canards and nine each in the main wings. The components of the engine can be easily accessed for maintenance, repair and overhaul (MRO). The distributed electric propulsion system of the aircraft will allow three generators to produce 3MW of electricity to power individual motors driving the fans. Each wing fan is driven by a 100kW motor, and each canard fan is propelled by a 70kW motor. The power-plant will ensure the aircraft to attain a maximum sustained flight speed of up to 400kt without limiting its range, efficiency and useful payload. It is expected to offer approximately 50% more speed than existing VTOL aircraft.